Last weekend was significant for two very good reasons. Firstly it was dry for two straight days and, if you've picked yourself up off the floor and can take another shock, the sun even managed to shine consistently and at some length! I know, we couldn't believe it either and for the first time in what seems like an age got some proper walking done covering about twenty miles of glorious Welsh countryside in the process. First up on Saturday was a local route from our very own front door taking in large swathes of upland common before dropping down through the Lliw valley with its twin reservoirs. Throughout we were treated to glorious, wide open views, many of which we've not seen since last summer and best of all, we met barely a soul all day. Given the time of year it's perhaps not that surprising that birds were a little thin on the ground but excellent views of a Green Woodpecker, displaying pair of Great-spotted Woodpeckers and the almost constant accompaniment of Red Kites, Buzzards and Ravens was good enough for me. The real surprise though was finding a Grey Wagtail just outside our garden gate when we returned. Not bad, not bad at all. Come Sunday morning and things were looking even better with a cloudless blue sky creating a real sense of Spring. The birds were singing, Gower looked fantastic off in the distance and we were raring to go. It was only once you stepped outside however that the bitingly cold wind became an undeniable presence, but was that going to stop us? Hell no. 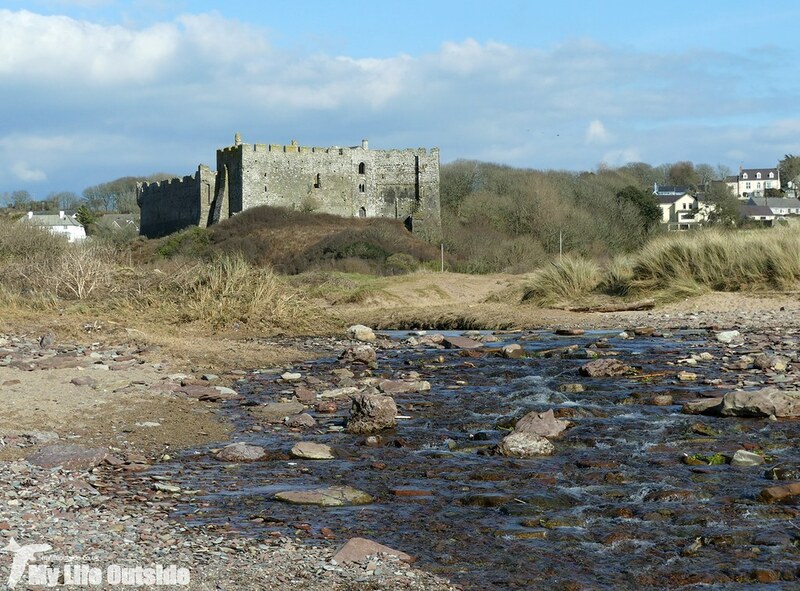 Instead we drove out to Pembrokeshire for the first time this year to walk a route focussed on the village of Manorbier. 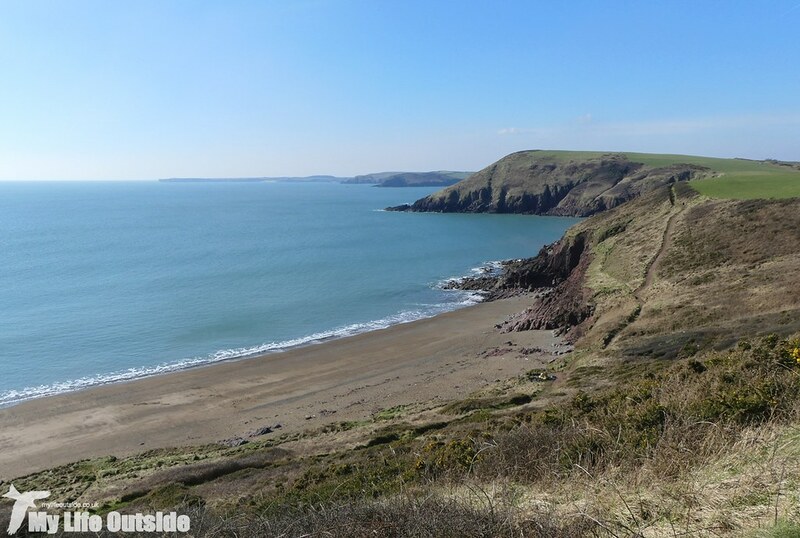 The coastline here is stunning at the best of times with the view across Swanlake Bay particularly appealing. We couldn't resist dropping down onto the beach and were soon enjoying the sight of a Great Crested Grebe fishing in the shallows just offshore. It worked first one way then the other in what were clearly fertile waters. From up high it became obvious that the main area of focus was a deep shelf and it wasn't long before a Shag had joined the hunt. Further out and Emma, top marks to her, spotted a splash that turned out to be one of at least two Porpoise. They were in no hurry to move along and gave excellent if distant views for at least the next twenty minutes. 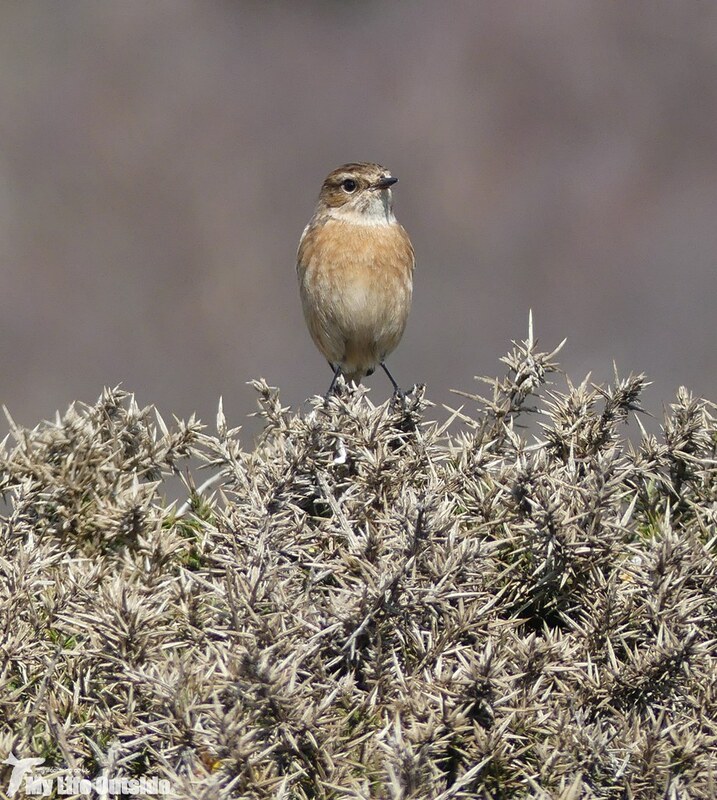 Closer to home and Stonechats seemed to be the dominant species with at least three pairs spotted, one with another male trying to muscle in on the action. In the confusion this female popped up on a section of salt and wind battered Gorse presenting me with a classic pose. 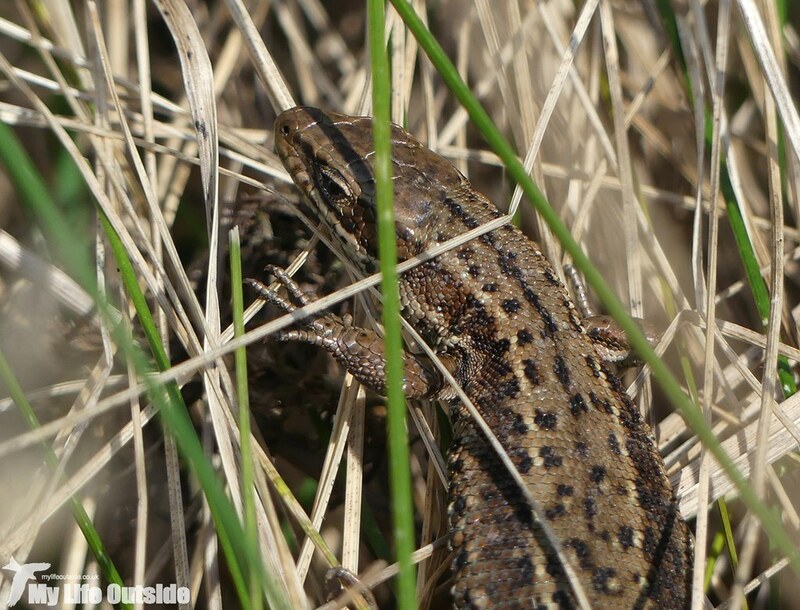 Out of the wind temperatures rose dramatically and it was a pleasant surprise to find this Common Lizard basking in the sun. Despite my best efforts I never did manage to get a completely unobstructed view but had to include this shot as it's probably one of my earliest Lizard sightings to date. 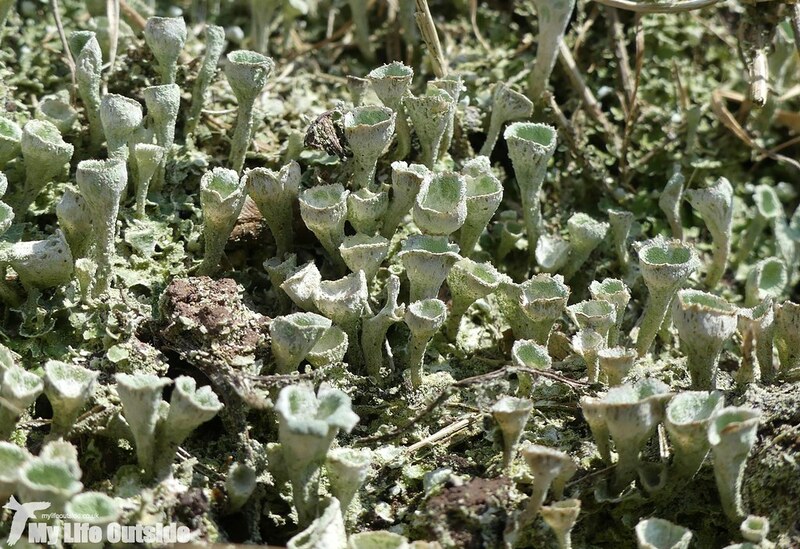 With our focus still on the ground we spotted an impressive growth of lichen, species as yet unidentified. Rounding the coast into Manorbier Bay we got our best views of the day across to the village and castle. Several surfers were trying to catch a wave and a few brave souls were even dabbling their toes in the sea. I on the other hand was having none of it. The sea is for one weekend around August time and that's about it. Saying that we are in the market for a couple of kayaks so I might have to review those limits and, in the words of my significant other, man up. Anyway, enough rambling and here are the photos. The Porpoise from earlier were still visible at the mouth of the bay and we only lost sight of them as we headed around to Old Castle Head. 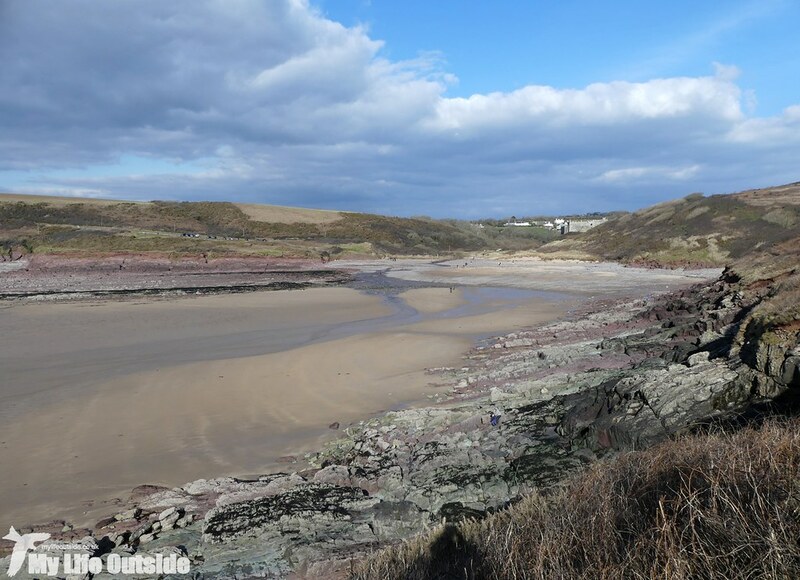 There a military base forces the coast path inland and we took the opportunity to loop back to Manorbier and head for home. As it turned out we'd timed things perfectly with a weather front just starting to push its way in. Here's hoping for more sun this weekend.